Damn Hoskins.....your idea of putting Four Star into her really did increase our take off. power! 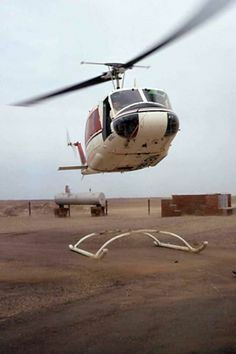 Note: This is not the factory recommended procedure for changing skids....but when it became necessary due to being in a remote location where no crane or jacks were available.....Bristow Engineers were able to convince a Pilot into giving it a try (enough Beer and they can be convinced of anything). Of course....the prerequisite piloting skills required by the Company of all Pilots (in those days) made this alternative procedure possible. I tried to find the story behind this at the Bristow Old Gits page but could not find it amongst the hundreds of pages of photos and stories. Last edited by SASless; 25th Mar 2019 at 12:43. "That's two skids on the ground and also in our pants then.."
"Jeez, I thought that ground resonance was going to shake us apart!" Chief, we need some bigger Ty-Wraps! Helicopter crew fooled by quick setting cement. "No wheels on our wagon - but we just keep skidding along!" When Section Officer Harvey radioed Hoskins to drop his gear tonight, that wasn't what she intended. Then some smart slave driving manager realised that if the skids don't leave the ground then crew flight hours won't accumulate. Reduce flying weight at all costs they said to save fuel they said, leave the undercarriage behind they said, and the doors they said, But Hoskins I don't remember them saying leave the fuel in the bowser and all we get is 10 feet altitude. "Picketing stakes? what picketing stakes?" "They're the land version of the bouncing bomb, but these are designed to slide up to the target"
"Remind me Hoskins, that's the last time we overnight at Liverpool." "Iv'e got an awful feeling this sortie will end with us going belly up...or is it down?"